While there is no known cure for Alzheimer’s disease -- a chronic neurodegenerative disease considered to be one of the biggest threats to South Korea’s future economy -- researchers have found that certain foods may reduce one’s risk of developing the condition if consumed regularly. According to Dr. Moon Yeon-sil from Konkuk University Medical Center, those who follow a Mediterranean diet have a significantly lower chance of developing Alzheimer’s disease than those who don’t. 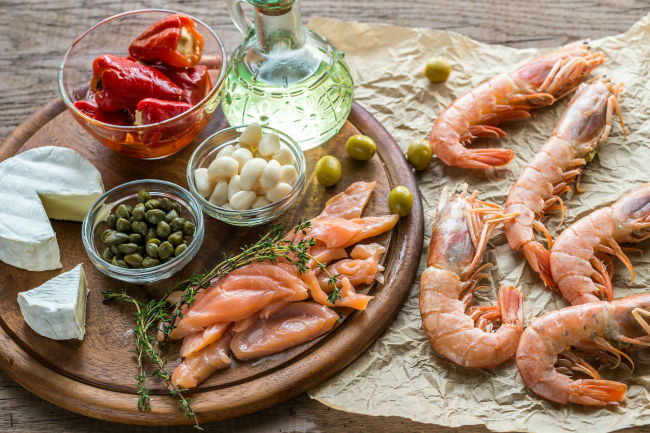 The Mediterranean diet is a nutritional recommendation inspired by the traditional dietary patterns of Greece, Southern Italy and Spain. The diet consists of a high consumption of olive oil, legumes, fruits, vegetables, whole grains, fish, and a moderate consumption of red wine. Although the doctor did not conduct her own research, she cited the Taub Institute for Research in Alzheimer’s Disease and the Aging Brain’s 2006 study which found that a higher adherence to the Mediterranean diet is associated with a reduction in risk for the condition. The specific study researched a total of 2,258 individuals living in New York City for over 10 years. Those who followed the specific diet strictly were 40 times less likely to develop the disease than those who did not follow it at all. The doctor also said coffee, milk and a moderate consumption of alcohol -- a single glass daily – can delay the disease. “One of the studies I found argues that coffee drinkers have a 30 percent less chance of developing the disease than those who don’t drink coffee at all,” she said at a forum on Wednesday. Caffeine is known to block inflammation in the brain, specifically adenosine receptors, which can start a chain reaction that triggers the mind’s cognitive decline. Milk, on the other hand, is known to be one of the best sources of a key vitamin -- B12 -- that is thought to reduce the neurological damage to the brain that may lead to Alzheimer’s disease. Beans contain plenty of fiber, as well as low-fat protein for growing brain cells, while poultry provides dementia-preventing B vitamins and low-fat protein. Nuts are rich in vitamin E, which is known to lower one’s risk of Alzheimer’s, while fish are rich in brain-cell-fortifying omega-3 fatty acids. Among fruits, berries are the only ones thought to slow brain decline thanks to their flavonols. Dr. Toshiharu Ninomiya from Kyushu University in Japan, on the other hand, found that Japanese residents who followed strict traditional Japanese diet – beans, fish, eggs, fruits, potatoes, seaweed and vegetables – with a regular consumption of milk were much less likely to develop Alzheimer’s. Based on research he conducted from 1988-2005, those with nontraditional diets were 34 times more likely to develop the disease than those supplementing a traditional diet with milk. According to Ninomiya, Japanese citizens aged 75 or older drank an average of 62 grams of milk daily, which is significantly higher than the average daily milk consumption of their Korean counterparts, which is 18.4 grams. With the elderly population rapidly increasing, dementia is considered one of the most serious threats to Korea’s future economy. Health authorities predict the number of people with the disease will exceed the number of those who are aged 65 or older by 2024 and that it will cost some 43.5 trillion won to treat the patients in 2030. To prevent or delay the disease, Dr. Moon recommended consuming the above foods while keeping the following foods to a minimum: red meat for four times a week or less; fast food, fried food, and cheese for less than once a week; butter or margarine at fewer than seven tablespoons a week; and pastries and sweets at less than five times a week.